Please say a prayer. The Camp fire started at 6:30am today and is growing 80 football fields per minute. The town of Paradise, population 28,000 was wiped out in 1 day according to the news. Absolutely devastating. I saw a picture of both highway lanes one way evacuating cars, and a guy walking against traffic to Paradise to find his missing wife and daughter. The air here is getting worse hundreds of miles south. Man looks bad for Paradise and Chico! Just got off the phone with a friend who lives in Los Molinas. He is out of town and missing it. Sounds like it’s right there in his backyard! 1,000 structures lost including the hospital. I’m tearing up because I’d be doing the same thing in that situation as this guy. Prayers for everyone that is effected. I’m 3+ hours southwest of the fire (I drove it a hundred times when our lived in Chico), the smoke and smell of fire is strong this morning. I can’t help thinking I’m smelling somebody’s burnt home. Bill, what are local reports on Chico? Is it still threatening? On the news- evacuating the eastern side of Chico and they cancelled classes at Chico State. Evacuation locations are further away from Chico. 5 known fatalities I read. Air in the bay area has reached ‘red’ air quality level. I went to a customer meeting and it was uncomfortable breathing. Prayers sent for all involved. Here’s the latest CalFire report. If you have a people there you’re worried about, and need for updates, there’s a tinyurl link. Wow, that's a crazy picture. Prayers sent for all involved. Hope things get better before they get any worse. Prayers up! Hopefully they will eventually adopt proactive methods to help out with these type of fires in the near future. Thank you. My friend lives just up the road from there in Los Molinas. He has a service HVAC business with lots of customers in Paradise (or he had). I was closely following because I know the area well. Totally horrible situation up there! My buddy has a 4 gun blind in a rice field in Richvale- evacuated. West of Hwy 99 which looks like where they’re stopping it. It was evacuated when they thought the Oroville Dam might fail last year. We are about 20miles east of Oroville and close to evacuation warning areas. Have our stuff packed and buttoning down the matches. Keep praying! I’m 3 hours under normal circumstances from Chico. PM me if there’s sonething I can do. I assume you get the incident report updates by email? I’m getting them all day long. Most evacuation centers are full. hope all of ya'll will be o.k. We are getting all Cal Fire updates and have a line to the Fire Chief for updates since we have lots guests typically on our camp property. Will PM you for sure if we need anything, thank you! High likelihood of the fire spotting over Lake Oroville this evening with Red Flag warning winds. Winds are the biggest threat for this fire getting even worse so pray against those! The death toll iis raising and the Deputies are going house to house. Anthropology and DNA teams are there- it’s not good. I met a guy yesterday who’s friend evacuated Paradise towing his boat. In traffic an ember went into boat and it caught fire. He had to disconnect the hitch on the shoulder with the boat on fire and leave it. He got out. My barber’s niece lost 4 houses- 3 investment properties plus hers. Thoughts and prayers to those who are caught in it and those who are trying to fight it. Reports are they’re controlling it and protecting structures and lives. The death toll is rising. This article, if true, says the power company sent her an email they needed to come on her property to check out sparks. If it’s true, there’s the cause. 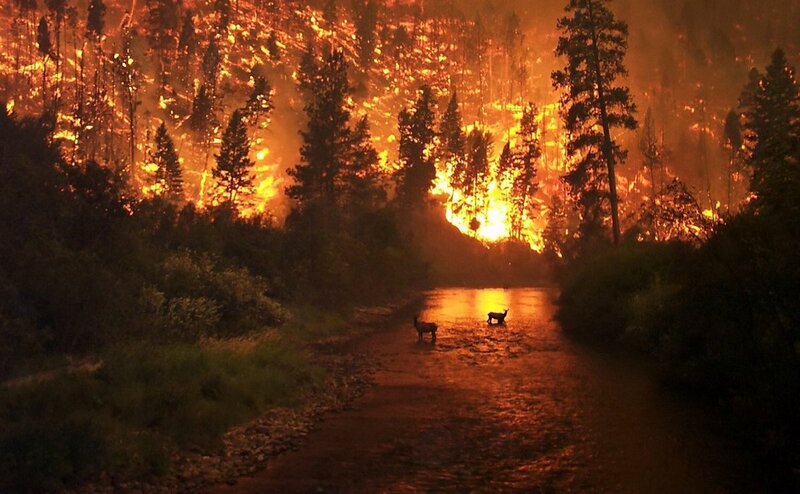 I have three friends that live in Paradise and all three lost everything but they are OK.
Hell on earth. Law enforcement and firefighter’s homes destroyed while they were saving other people’s lives. I’ve asked a local friend who’s a Sheriff what is being done to help families short term. That’s rough to read. I invested in Kuiu clothing for this elk hunt. I need to go through my older hunting camo and thin out the rack in my garage. If any wears size L and can shoot an older PSE compound let me know. Any pets needing a temp foster home? My daughter sent a picture from Sacramento in the direction of Camp Fire (north). There’s mountains somewhere in the distance. And a sun somewhere to the west. From road sign near the I80/ I5 intersection. Oh man that is horrible. I watched it. He mentioned that the lady was more concerned about putting her makeup on first before she and her disabled husband could leave. They both were burned alive in their car. There’s a story on the web about a retired carpenter who stayed to fight the fire with his elderly mother inside. He succeeded. God bless him. Butte County is rural and conservative. I wouldn’t wish a looter to try to steal what’s his and meet his friend ‘Remmy’. He scared them off his neighbor’s smoldering property. Last edited by Bill; 11-13-2018 at 07:27 PM. There are 63 confirmed deaths, and the new list has over 600 people listed as missing. Schools and universities are cancelling classes all over because of the unhealthy air quality. There’s camps setting up at the Walmart in Chico. I’d think after all the prior fires in CA, they would have a plan and be able to mobilize. Our daughter is driving here today, she described the sky with the sun obscured “like a Steven King novel”. My cousin lives in Oroville close to the lake area . They are on high alert ! Today I read 74 dead and over 1,000 people unaccounted for/ missing. Lord have mercy. My daughter said Butte County coroner’s office is not equipped for this size disasters. They’re using refrigerated 18 wheelers to transport remains to the coroner in Sacramento and they fear they’ll exceed resources and then go to Reno. My friend’s buddy is in Chico PD. He raced to Paradise on Thursday morning and found elderly people wandering on the side of the highway. He filled his cruiser/ suv and while driving out the road was molten macadam in front. He called-in helicopters with water buckets to drop in front of them to cool it to where they could proceed. All were saved. The president is there today. Saying it was the result of poor forest management caused by environmental regulations is being reported as insults to the 10,000 people fighting the fire or searching for remains. The Camp Fire is 100% contained. Great job by all the men and woman who worked so hard. I read there were 800 people searching house to house for remains on Thanksgiving, before heavy rains.